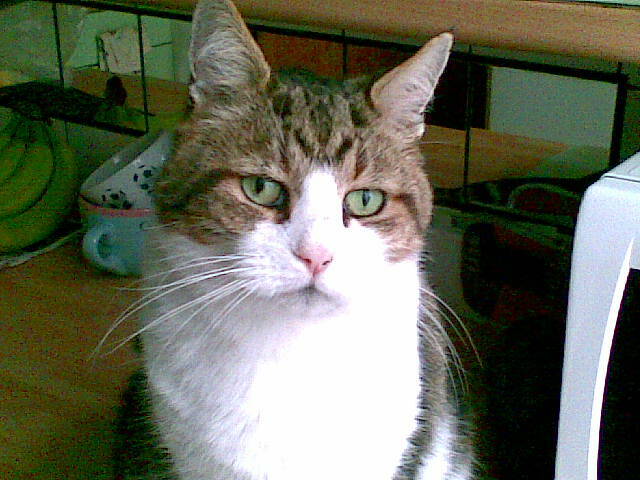 Beige, my favourite cat, died on Friday 25 May 2012. He may have been about 14 year old. We don't know because he adopted us in 2001 and the vet thought he was about three years old then. We moved into our house in April 2000 and very soon we noticed a stray cat hanging around the area. He would come into our kitchen to eat the food we had put down for our own cats. He would run away whenever we came into the kitchen. One day Ula, my wife, was sitting on a small stool and he didn’t notice her because he only had eyes for the food. After he finished eating he looked up and saw Ula and nearly jumped out of his skin and ran outside! Slowly, he realised that he wouldn’t come to any harm and he would still come to eat even when we could see him. One day we saw him resting in another garden and we felt very jealous! Luckily, he started to stay with us even when he wasn’t eating. One day, he climbed out of our front window and ran across a busy road and nearly got knocked down by a van. He was obviously looking for female cats. Ula suggested that we take Beige to the vet to be castrated. I was uneasy that Beige had come to live with us and one of the first things we did was to castrate him. Pretty soon I realised that it was safer if Beige didn’t have the desire to roam the streets. We decided to take him to the vet that we registered with when we first moved to the area. The vet, Simon Huntley, was fantastic. It was a small practice but Simon was everything you could want in a vet. Unfortunately, Simon emigrated to New Zealand a few years later. After the operation Beige never went near the road again and neither did any of our other cats. An example of Beige’s caring nature was when he accidently hooked his claw into my arm. His claw was quite deep in my arm but he kept very still while I unhooked his claw. Most cats panic in this situation. 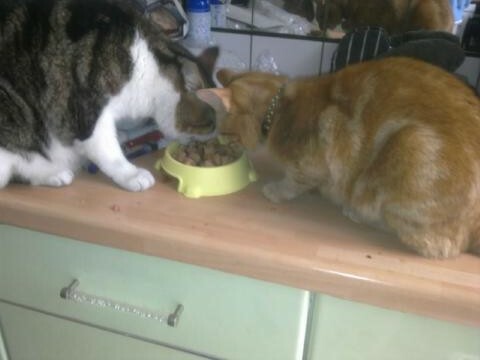 Beige, although being more powerful than our other cats, was always very respectful to them. Once, I saw Kitek and Beige sitting facing each other just relaxing. Beige was distracted by a noise and Kitek took the opportunity to slap Beige twice in the face and ran off leaving Beige with a quizzical look! Tiny was another of our cats and despite being small she felt that attack was the best form of defence so she would swing at Beige any time she felt he got too close. Beige never once retaliated. Kitka II would always greet Beige by pushing her head into his face. Beige always took this with good humour. Whenever we accepted strange cats Beige would accept them, too. There were examples of this when two kittens started to visit us and another when a cat owned by a poor guy would come to us to eat. Beige had a different attitude to strange cats who he thought were trying to invade his territory. He would chase them away and aggressively fight them. He didn’t seem to enjoy the fights and afterwards he always seemed stressed but he felt it was his duty. Ula’s daughter, Iza, found a kitten near her work and, after asking around and putting up notices, she brought him home. Beige immediately helped him – teaching him how to play with toys and enjoy catnip. Sometimes Beige wanted to copy humans. He would lay in bed with covers up to his neck and his head on the pillow. 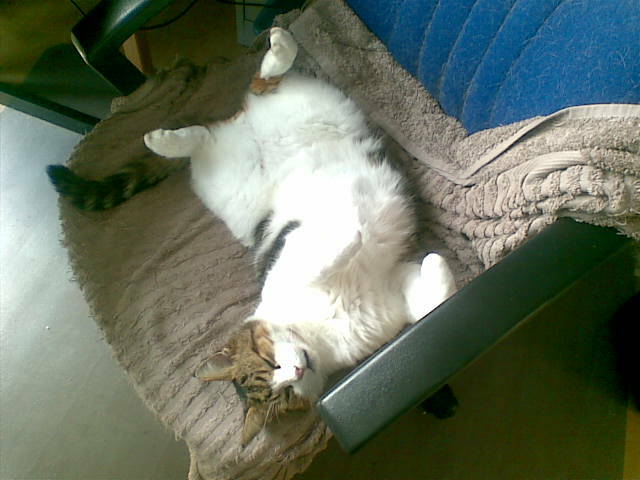 He used to sleep on the chair next to me in my office or sleep next to the monitors. Sometimes when I was trying to type he would climb between my arms, the keyboard and my chest and go to sleep with his head resting on my arm. Other times he'd sit on my desk right in front of me. If he saw me looking at any papers he would go and sit on them. Luckily, he could always be tempted to move if I put some other papers on the desk and pretended to look at them! Many times he would be sat on the desk in front of me so that I had to get up and do something else and all that people could see would be his two ears which appeared to be sticking out of the back of the chair. Beige used to lay on Ula when she was in bed and stare into her eyes. He practical ignored me when Ula was in the bed! 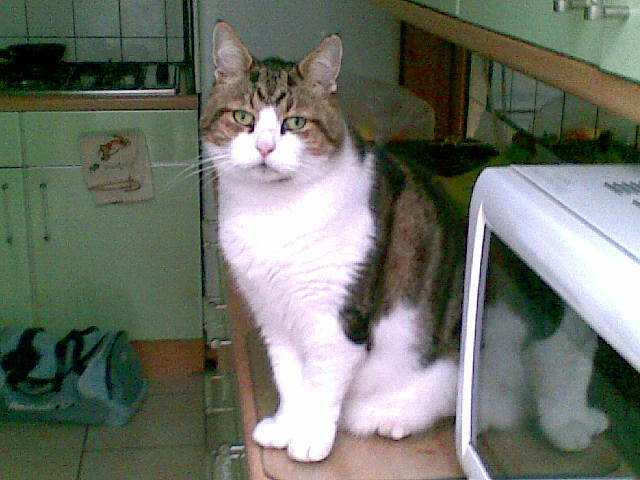 Our other cats are lovely but nothing compared to Beige – he was totally devoted to us. When we went out he would sit outside our gate until we came back whether it was 30 minutes or 5 hours. When he saw our car returning he would run to us to greet us. Iza had the same model of car as us and he would run to her car and when she opened her car door she could see the disappointment on his face. Ula said that Beige knew he could get away with murder. He only had to tell us that he wanted food and he would get it. We would buy turkey breasts from the shops and turkey carcasses from a restaurant we visited regularly. We think indulging him with this kind of food wasn’t good for his teeth. Ula said his breath smelled but the only smell I knew was when I buried my nose in his fur. I loved that smell so much! We decided to take him to our vet to ask for dental work to be done. We didn’t realise that the next few days would be the most traumatic days in the lives of Beige, Ula and myself. What happened after Beige’s operation convinced us that we will only feed our cats healthy dry food and will only subject them to operations in the case of an emergency. The risk of problems after an operation are not so great with young cats so I would still recommend you have your young cats castrated or spayed. We will also only take them to a vet that has the most advanced monitoring equipment with 24 hour care. Our choice is Stone Lion Veterinary Hospital in Wimbledon. The fees are more expensive but it is worth it. It’s about a mile nearer than the vets where Beige spent most of his last week and two miles further away than the vets he was registered at but Stone Lion Veterinary Hospital has facilities which are far superior having been awarded a Tier 3 Status of the Practice Standards Scheme by the Royal College of Veterinary Surgeons. Further information on this accreditation scheme for veterinary practices can be found on the RCVS website. The reasons why we didn’t register with them immediately are set out here along with what changed our mind. Beige’s passing was heart breaking but we will try to concentrate on how happy he was and how much pleasure he gave us in the 11 years we were together. Ula would always say: “Beige is Beige”. How true.